Dorina E. (Rosati) Inglesi, 95, of Milford passed away Thursday, June 2, 2016 at the Genesis Milford Center. 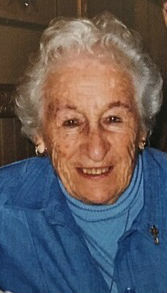 She was the wife of the late Albert J. Inglesi Sr. who passed away in 2006. She was born in Ronco, PA, daughter of the late Pietro and Emilia (Sanchioni) Rosati and lived in Milford most of her life. Mrs. Inglesi retired in 1986 from the Medway School system where she was employed as a cafeteria worker. She previously was employed as a sales clerk at the former Jordan Marsh Stores. She was a communicant of the Sacred Heart of Jesus Church and a member of the Sacred Heart Women’s Club, The Red Hats and Silver Striders. She is survived by her children, Raymond Inglesi and his wife Marissa of Kennebunkport ME, Peter Inglesi and his wife Kathy of Scarborough ME, Albert Inglesi Jr. and his wife Patricia of Franklin, one brother Albert Rosati and his wife Freda of FL, one sister Irene Strapponi of Milford, nine grandchildren, many great-grandchildren, many nieces and nephews. She was predeceased by her daughter Juna Testa. A Mass of Christian burial will be celebrated Monday June 6, 2016 at 10 A.M. at the Sacred Heart of Jesus Church, 7 East Main St., Milford. The burial will follow in the parish cemetery. Calling hours will be held Monday morning prior to the funeral mass from 8:30 to 9:30 A.M. at the Consigli Ruggerio Funeral Home 46 Water St. Milford MA. We send our sympathy to all the family. We only met her a few times but enjoyed her company very much. The grandchildren will miss her but they were blessed to have her for so many years. So sorry to hear of Dorina's passing! I'm sure Al and Juna were there to take her home! She always made me feel like I was a part of her family and I have many fond memories of wonderful meals at her table. My deepest sympathies to you Ray, Albert and of course Peter and to the rest of her family she leaves behind!